Where exactly the beats are ‘at’? I’ve made a website for finding gigs in Ireland. 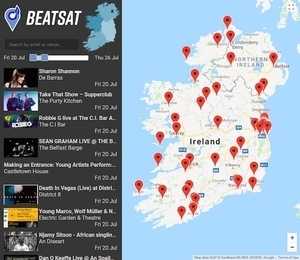 It’s still a work in progress, so if anyone has any bug reports, or suggestions, leave them below or send t to theteam@beatsat.ie. Posted in Misc and tagged Concerts, gigs, Website of the Day at 3:23 pm on July 20, 2018 by Bodger. Always looking for a simple and comprehensive guide !!!! Appears to be the same map showing where the Gas comes from. Nice headline – Brings back great memories of a “buster burger” and a mug of tea served with milk and two sugars already in (and maybe a bottle of plonk under the table) at half three in the morning on South Richmond Street. Was it that manky place? Kind of a formica look to it? When was that, Old Boy? Yes – it was manky, low lighting, dark wood trimmed red formica, leatherette-seated booths and faded photos of the showbands that used to eat there after gigs on the walls. It only opened at midnight to six and always looked doggedly derelict during the day, and not much better at night. A quick search would suggest that it finally closed in about 2012 but I hadn’t been in it for a few years before that. Arra it was a legendary spot. Great site. Nice job. I’ll be using this…. Gigs Plan gone a long time now. I still miss the record and tape exchange place beside it. Still there, but hasn’t been open since the late eighties I reckon. Doesn’t entertainmentireland.ie already have a comprehensive gig slot across all genres ? shades of rhythm in the button factory tmw night..